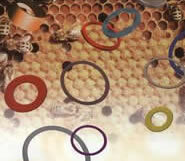 Rubber washers, gaskets, seals, rings, mouldings and tubing manufacturers. Honeycrown Rubber Products Ltd – a precision polymers mfg – has been established since 1982 and uses its strong financial base to invest in state of the art rubber processing technology and technical testing equipment. Our quality is driven by this total commitment to our customers and employees. Injection moulders and automatic cutting machines are used for high volume production runs and, for greater flexibility, an extrusion, curing, grinding and lathe cutting process for smaller orders. All o-rings are available in a comprehensive range of materials including Nitrile, EPDM, Neoprene, Natural, SBR, Silicone and Viton in food grade, WRC and FDA approved varieties or to your specification. In addition to the outstanding quality, consistency and technical excellence of our components, it is the emphasis Honeycrown Rubber Products Ltd place on customer support that sets us apart from other companies. Product development and process improvement teams focused on producing technically superior compounds allow customers to seize new product opportunities. Our total quality management procedures have gained us a whole catalogue of certificated approvals from international, national and industry bodies, plus leading manufacturers from across many sectors of the industry. Our expertise and experience as a precision polymers mfg enables us to create global customer partnerships in both traditional and emerging markets. For further assistance and information on Honeycrown Rubber Products Ltd, call us on +44 (0)1978 853 730 or email sales@honeycrown.co.uk .